2017 Webinar Subscriber Summer Spectacular! I am sharing an announcement from Legacy Family Tree Webinars, as I am please and proud to be a speaker and a student of this wonderful educational platform. Legacy Family Tree Webinars is celebrating its summer with a Summer Spectacular. Their website is Legacy Family Webinars. It’s our way of saying thank you to our webinar subscribers and inviting everyone else to preview these excellent classes! This summer we will not only have new members-only content, we will also have full in-depth series to help you take your genealogy to a new level. We’ll be sharing with you five new members-only series, released every two weeks, throughout the summer of 2017. Archivist Melissa Barker is taking her professional expertise in the Houston County, Tennessee Archives and helping genealogists everywhere find hidden resources in archives, libraries and societies. Texas is the second largest state in the United States and has a rich history. Whether your ancestors settled there during the Republic of Texas or after statehood, Teri E. Flack will help you find details about their lives. You loved his class “Complete Photo Restoration in 4 Easy Steps” so we’ve brought Eric Basir back for an entire 6-part series on Photo Restoration. Learn how to make the most of your photos from scanning to editing and restoration. Craig Scott is one of the most sought after speakers on military research. In this series, Craig will help you navigate the extensive records created to document Revolutionary War soldiers. You still have time to sign up before the Subscriber Summer Spectacular starts! In addition to the new summer series, you’ll have access to all 529 classes in the Legacy Webinar Library including all the handouts! It’s just $49.95/year or $9.95/month. There is a recent update to Evidentia that is awesome. After our Wacky Wednesday with the developer, he made some awesome changes. Rather than talking about it, let me show you. I have ready determined that the two lines are Inconclusive. Meaning, I need to do more research. To me, the Yellow Check Mark tells me that I have have some data, and that I have drafted by conclusion, really my Current Thinking on the relationships so far. Further down the page I see the Summary of Findings, or Current Thinking, and that there are proofs there, but need to be reviewed. More work to do. Each event has my current thinking. I chose to precede my current thinking with the date. Running the Proof Summary, I have completed my proof summary, but it is inclusive. Now I need to do some work and prove some of these. But, I have a visual indicate on where I stand and the written details. I have this We’re Related APP cousin to work with. When I record the data from my Cell Phone and enter it into EXCEL and I see something strange or not right, I use YELLOW as a reminder that I need to look at this later. The GREEN indicates I have that person in my master database. Entered the data into Evidentia, as is my current practice for this project. Made an entry for follow up in the “conclusion” / Current thinkings, then went to find what I might already have. When looking at the Common Ancestor, Phebe Birdsall, her children had two different Surnames. I recorded Phebe Birdsall married a Bartlett (_____ Bartlett) and she married a Havens (_____ Havens). That is another reminder that I have some work to do. I wondered if my own master database had any hints. When I looked at my master database to see how far I went back on this cousin connection and recognized that, in fact, I had a Source with a Havens and a Bartlett. 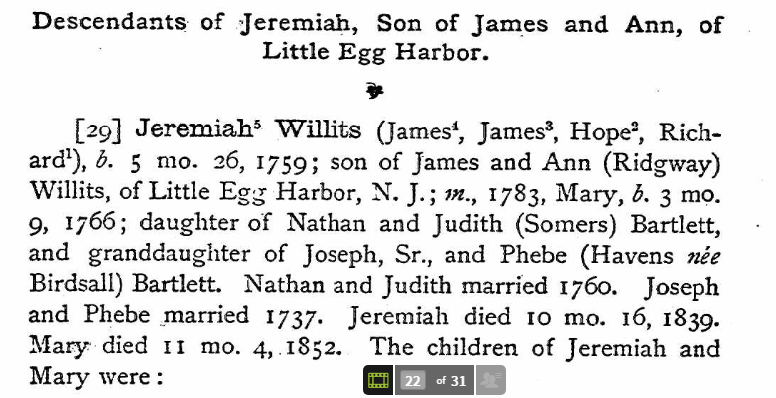 Alfred C Willits, Ancestry.com (www.ancestry.com accessed, 30 Sep 2013), online book; mentioned as James Willits’s wife, page 8. leaving his wife Phebe Birdsall. Phebe (Havens nee Birdsall) Bartlett agrees with my current thinking. The Birth Year of John Havens was about 1728, and Nathan Bartlett about 1738 would confirm for me, at this point in time, the marriage order. Need to put that citation into the proper format, but that is what I had in my database. 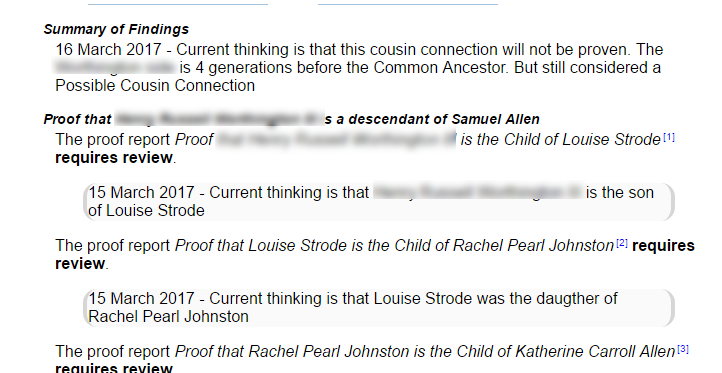 We’re Related–Is the information items the Same ? 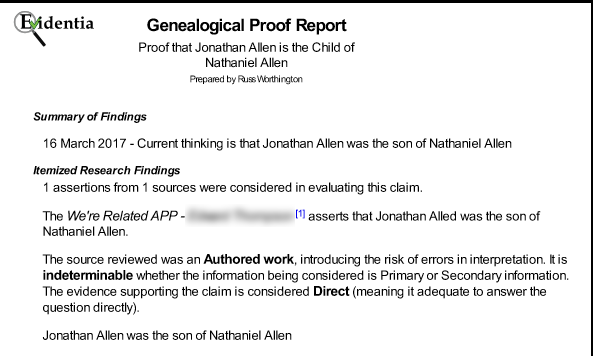 A couple of days ago, I was asked why not just bring in my We’re Related data from my genealogy software program, using a GEDCOM, into Evidentia. My reply was that I wanted to look at the original data (again), to see if I was in too much of a hurry, just to select that same Facts for the person that I did when that person appeared again. I can only share my experience here, but I have two examples of why I want to look at the original data from the APP. I transcribe my data from my phone to an EXCEL worksheet and then to my database. I may find some issues going from the Phone to EXCEL, then from EXCEL to my database. But I mark up the spreadsheet as I go, because if may be a couple of days before I go from the Spreadsheet to the program. Along the way, I recognized a couple of people with some differing pieces of information, but not sure that I picked up the fact that the information was, in fact, different going from EXCEL to my database. Since I already had the person in my database, I had NOT picked up the fact that it was different. I have two examples of my error. The person to look at is Jane Addie Worrell (1864 – 1936). This is from one of my We’re Related APP cousins. It’s Jennie Adella Worrall this time, 1865 – 1936. The names before and after are OK, but her entry is WRONG in EXCEL. When I entered it into my database, I made the mistake of just adding a citation to the wrong date and name. William F Allen 1830 – 1860. It wasn’t until I did my data entry AND Evaluation of the data, did I discover the error, my error in data entry into my database. 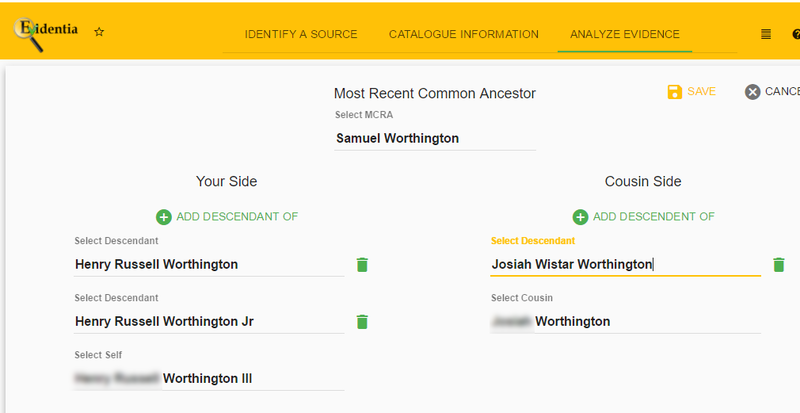 2) The We’re Related APP may give you data from different people with the similar names, and dates. Don’t assume that the APP will give you the SAME information for that same relationship. Now to go back and fix my database. So far, I have been talking about Information from the We’re Related APP for building a Possibilities Tree. Why not toss in some DNA Results. I know my side already has some We’re Related entries, maybe this will help Prove some of the APP information. Created a New Most Recent Common Ancestor Possibilities Tree. In this case, the DNA shows the common ancestors, I will use the male side, as he is already in my APP data. I didn’t have to add my side, as they were already in my database, so just added the two new people. This DNA Cousin isn’t on Facebook, so he won’t show up in the APP. The good news is that the DNA screen from Ancestry and the Relationship information from Evidentia are the same. 1st Cousins, once removed. I thought that I had done that relationship. 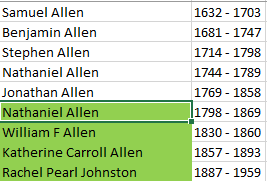 So I pulled up my EXCEL file and recognized that I have two (2) Nathaniel Allens here. I had done a Nathaniel and Jonathan Allen relationship, but missed one. When I reviewed the Claims from this source, I had missed that father / son Claim. Here is where including the birth and death year in the display comes in handy. It was very easy to pick the right Nathaniel Allen when Cataloging the Information. Reran the Log and it’s resolved, or showing Complete. I took the data from my EXCEL spreadsheet and entered that information into the Cousin Tracker Log. The APP cousin name appears in the Citation. As you may be able to see, there are also 2 other We’re Related APP Cousins in this database. The Citation must tell me which APP Cousin the information came from. I now Catalogue the data from the Spreadsheet into Evidentia. 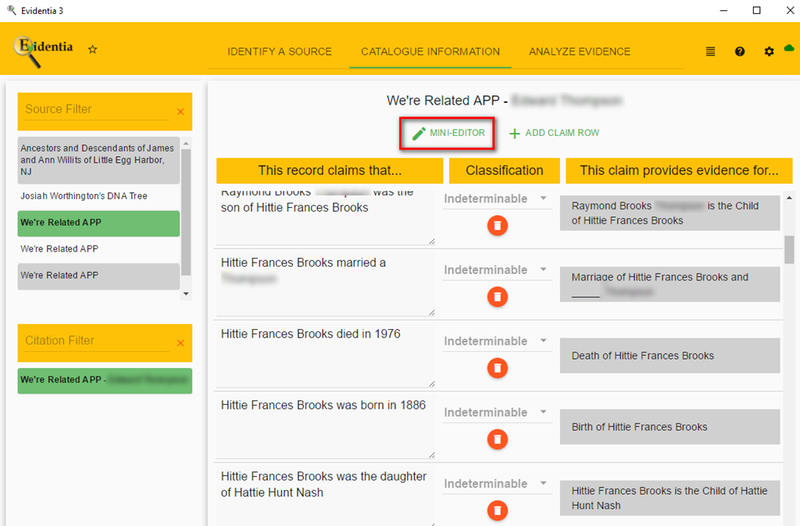 The Classification of the Claims or Information Items is done with the pull down menu, and the linking the Claims to the Profile or person is done as usual. The results are seen below. Now the EXCEL information is now in Evidentia for me to evaluate. Again, this is not a How To blog or blog post, but my initial experience with this new feature.